DJI is offering upgradable modules for WooKong-M with which customer purchases the best module better suit for the work requirement.“Single Waypoint” and “5-Waypoint” level can be upgraded easily for existing WooKong-M owners via DJI website or purchased directly from DJI dealer. This upgrade path is sequential rather than random. In another word, to have WooKong-M 5-Waypoint, WooKong-M Single Waypoint must be upgraded first. WooKong-M Single Waypoint is suitable for high altitude AP work. Allow pilot and ground crew using ground station laptop to monitor real-time flight path using Google Earth Map. Onboard monitor shows altitude, flight attitude, helicopter orientation, rx voltage, throttle, pitch and flight mode. The use of either ground station laptop or Joystick the flight distance is greatly increase as the aircraft can now be controlled via data link over the use of radio/receiver. “Click&Go” feature allows pilot to drag single flight route on ground station screen, assign altitude and flight speed to a single destination. Altitude, speed and destination point can be changed on-the-fly with flight path tracking. 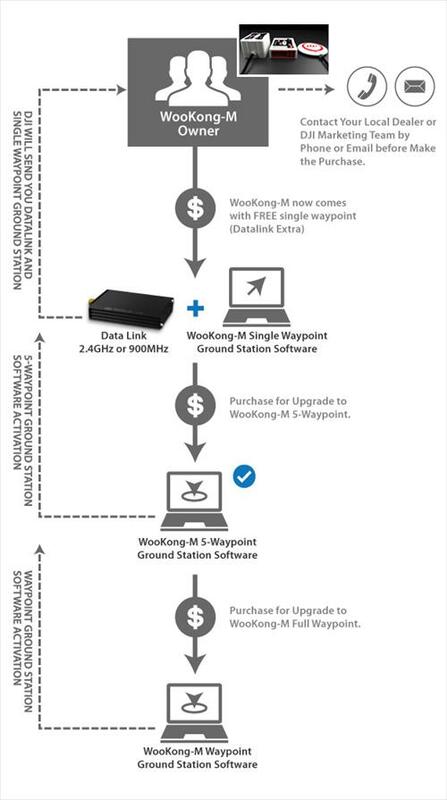 WooKong-M 5-Waypoint is the last step of the upgrade path to WooKong-M full Waypoint with 50 waypoints.The 5-Waypoint including all the functions of Single-Waypoint could set five Waypoints to set up a simple flight mission and execute the task automatically.